In my previous article, we looked at how Harvard University researchers are developing gentle touch capabilities for undersea robots. Advances in soft robotics, materials science, and artificial muscles are also helping to make robot hands more dexterous. The global market for packaging robots will grow from 2016 to 2024 at a compound annual growth rate of 14 percent to $5 billion, predicts Transparency Market Research. Factory modernization, efforts to improve efficiency, and increasing adoption of industrial automation are all contributing factors, said the research firm. At Saarland University in Germany, researchers have developed artificial muscles using shape-memory alloy (SMA) wire. This allows them to create flexible and lightweight robot grippers for industrial applications and novel prosthetic devices. The muscle fibers are composed of bundles of ultrafine nickel-titanium alloy wires that can tense and flex. The material itself has sensory properties that allow the artificial hand to perform extremely precise movements. SMA technology offers significant advantages over other techniques, since the wire can return to its original shape after it has been deformed, according to research term leader Stefan Seelecke. Researchers in Germany are using shape-memory alloy wire for lightweight robot hands with sensory properties. At MIT, objects in the environment are viewed as aids to grip stabilization. 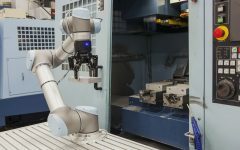 In addition to the manufacturing and supply chain sectors, food processing, healthcare, and exploration will benefit from cheaper and more dexterous robot grippers. The SMA wires function as imitation muscles in the robot gripper. Multiple strands of the material interconnect the finger joints and serve as flexor muscles on the front-side of the finger and as extensor muscles on the rear. To give robots a precise and gentle touch, engineers at Saarland University have equipped an artificial hand with muscles made from shape-memory alloy wire. To enable rapid finger movements, the researchers copied the structure of natural human muscles, grouping very fine SMA wires into bundles that mimic muscle fibers. Although as fine as a thread of cotton, the wire bundles possess the tensile strength of thick wire. Unlike most other types of artificial hands, such as those used in industrial production lines, the SMA devices don’t rely on clumsy, expensive, and often imprecise electric motors or pneumatics. Another benefit of using SMA wires is that the robot gripper can respond in a natural manner when someone intervenes while a particular movement is being carried out, allowing humans to literally work hand in hand with a robot. A chip controls the relative motions of the SMA wires, allowing precise, gentle movements to be carried out. The robot hand also doesn’t require any discrete sensors — the material offers inherent sensor properties. Engineers at the Massachusetts Institute of Technology have developed a technique that’s designed to give extra dexterity to simple robotic grippers. Led by Alberto Rodriguez, an MIT assistant professor of mechanical engineering, and graduate student Nikhil Chavan-Dafle, the team created a model that can predict the force a robot gripper would need to push against objects in its environment to adjust its grasp on an object. Using the model, a gripper that attempts to pick up a pencil at its midpoint but instead grabs hold of the eraser end could use something nearby to help it adjust its grasp. Instead of releasing the pencil and trying again, Rodriguez’s model would allow the robot to loosen its grip slightly and push the pencil against a nearby wall — just enough to slide the robot gripper closer to the pencil’s midpoint. Rodriguez describes the approach as “extrinsic dexterity.” He said he believes that the technique will enable existing robots to perform more precise and complex maneuvers. This will enable robot grippers to interact with the environment in a cost-effective way for agriculture, manufacturing, medicine, disaster response, and other applications, he said. To predict how an object may move as a gripper pushes it against a given fixture, the researchers designed the model to take into account several different factors, including the frictional forces between the gripper and the object; between the object and the environment; and the object’s mass, inertia, and shape. In its current form, the model predicts the force a gripper must exert on the object and the environment in order to maneuver the object to a desired orientation. For instance: How tight should a robot grip a bar, and how hard must it push that bar against a point to rotate the bar 45 degrees? Rodriguez and Chavan-Dafle recently tested the model’s predictions against real-world experiments, using a simple two-fingered gripper to manipulate a short rod. The rod was rolled, pivoted, or slid against three types of fixtures — a point, a line and a plane. The team measured the forces the robot hand exerted to maneuver the rod into desired positions and compared the experimental forces with the model’s predicted forces. Rodriguez said he was pleased with the results and now considers the model validated. The next step is figure out a way of planning motions to generate certain types of trajectories with reasonable accuracy. Getting a handle on this process would help designers engineer fixtures within a local environment to ensure that the robot’s motions are reliable and can be executed faster. The MIT researchers are also exploring ways in which a robot might use gravity to toss and catch an object or how surfaces like a tabletop may help a robot gently roll an object between its fingers. Ultimately, extrinsic dexterity is an inexpensive way to make simple robot hands more nimble for use in many different types of applications, Rodriguez said. For instance, a surgical robot may push a scalpel against an operating table to adjust its grip, while an outdoor forensic robot could angle a piece of evidence against a nearby rock to better examine it.